TL; DR: Squidix Founder Sam Barrow was just 15 when he purchased his first server on Craigslist. His thirst for knowledge and desire to know what makes things tick led him to take a chance on the machine, and it’s this same passion that powers his company today. Since 2010, site owners across the US and UK have turned to Squidix for its reliable and secure hosting solutions. And the company’s success is due, in large part, to its commitment to hands-on support. We recently sat down with Sam, who told us how Squidix built its customer-focused philosophy on the enthusiasm and technical prowess of its in-house team of experts. For as far back as he can remember, Sam Barrow has had a passion for fixing things. At age 15, web technology became the new focus of his curiosity, so he began looking for old servers on Craigslist. Sam eventually stumbled upon a cheap, antiquated model he described as being “loud as an airplane” and started to tinker with it to get it running. The machine intrigued Sam, who would stay up into the twilight hours educating himself on how it worked through trial and error. Sam Barrow started Squidix after his passion for fixing things led him to learn about web hosting technologies. While teaching himself the ins and outs of server maintenance, Sam also set out to enhance his knowledge of Linux. And, once he thought he had a good grasp on both, he decided it was time to take his project to the next level and founded Squidix. “I figured it would be nice to make some money off it,” he said. Sam’s passion to solve problems is cooked into Squidix’s philosophy. 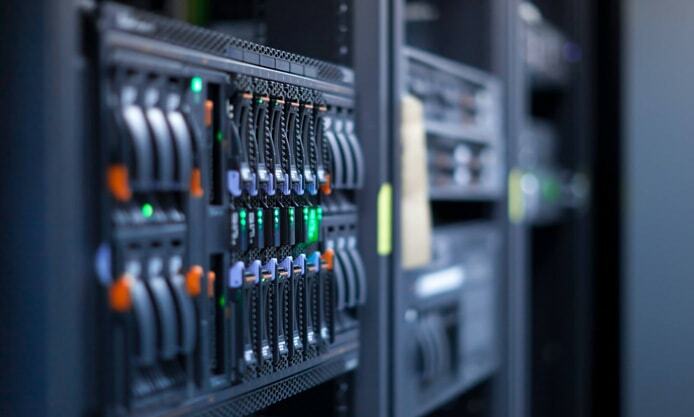 The company now serves up reliable, secure, and high-performing shared, virtual, and dedicated server hosting solutions to customers across the US and UK. But Squidix does this with a crucial difference — Sam and his team are hyper-focused on customer support. Sam described the experience of starting out in the hosting industry as both enjoyable and educational. Squidix initially began attracting customers because the team offered hands-on coding and in-house development services. “I used to do a lot of website repair early on, specifically advertising for broken websites,” he said. By focusing on the repair aspects of website management, Squidix was able to distinguish itself early on. While many hosts simply provide server space for webmasters, Squidix was primarily concerned with ensuring proper site operation and consistent uptime for clients. Squidix evolved from a single server to a host providing web solutions to customers across the US and UK. Technical expertise is an indispensable asset among any support team, and Squidix’s staff is well-equipped to remedy any issues its customers face. Staying true to his original plan of helping customers broadcast top-notch web properties, Sam still fixes websites — but now does this from a hosting perspective. According to Sam, the usual approach the industry takes to such technical issues is insufficient. Often, a support specialist will walk the client through a number of general troubleshooting steps rather than directly fixing a website’s code. Although Squidix is now less focused on code repair, the team is still able to troubleshoot websites through the lens of software and web development instead of from a purely hosting perspective. With a special focus on technical support, Squidix staff is reachable by phone, email, and support tickets. The development team is made up of a handful of contractors educated in Linux hosting. Squidix provides complete transparency into network status with the goal of maintaining the highest possible uptime rates. As a result, Squidix’s team, while small, can deliver the technical expertise its clients need to quickly solve problems and get back to business. With a total of five full-time employees (including Sam), Squidix relies on automation to speed up procedures. Sam told us Squidix uses automation to optimize both support and technical server processes. The move to automation — with many of the processes initiated by Sam himself — was done primarily to ensure efficiency and quality of service, rather than to cut corners on cost. With the advent of popular CMS platforms, such as WordPress and Joomla!, site building and management has become much easier for webmasters. When the internet was still young, web development was in high demand, as site owners needed someone to code their websites. Squidix’s hosting packages include intuitive development tools and features that ease site management for customers. Fortunately, Squidix seeks to empower site owners with greater DIY capabilities. The popularity of WordPress in recent years has caused Squidix to shift focus toward offering an all-in-one solution. According to Sam, even if behind-the-scenes tools, such as WordPress and cPanel, become obsolete, site owners will always need a sound support system. And they’ll seek alternatives that include as many capabilities as possible. With a passion to learn, Sam eagerly anticipates the inevitable shifts in the hosting industry. Similarly, the Squidix team is driven by an intense fervor for innovation. Just as with Sam’s initial approach, Squidix’s innovations are centered not just on fixing specific website issues, but also on addressing the wide-reaching pain points in the general hosting market. One of Squidix’s most recent fixes has been tackling outbound spam protection. While Squidix’s solutions are primarily created to ease the burden on clients, the host’s staff has also experienced similar issues. The personal experience of Sam and his team makes it easier to empathize with customers and devise solutions that benefit a broad user base. And he’s always on the lookout for committed professionals who share the same passion for technology.